Witches have a different grocery shopping list than us commoners. I imagine lizard’s eyeballs must be a pantry staple for brewing up a cauldron of potion. This year, I decided to be a witch for a day and stock my kitchen accordingly. There is one little problem though. I am deathly afraid of lizards and cannot even bear to look at those creatures. Extracting a whole jar of eyeballs would be next to impossible. Thankfully, I am reasonably resourceful and I know that a wannabe doesn’t always need the real thing to look credible. 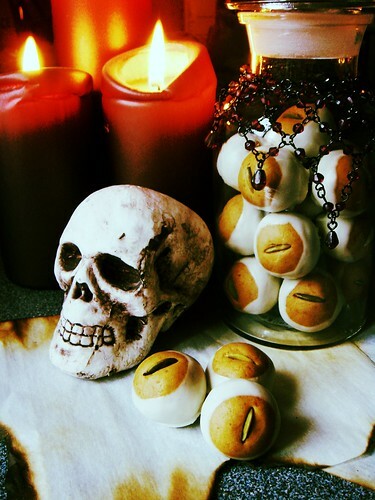 A jar of fake eyeballs can be had with just a bit of rolling and dipping. If you are from Ohio, you are probably familiar with the classic buckeye candies. The combination of peanut butter and chocolate is delicious without a doubt but I love to play around using different flavours. I experimented with a pink and brown version previously using Nutella for a Valentine’s Day treat. But now is not the time for cute. Lizard’s eyeballs call for speculoo spread, speculoo cookies, pumpkin seeds, and white chocolate. I’m too lazy to watch movies. In the rare cases that I do, my choices are not you would consider sophisticated. Mass market blockbusters that tug at viewers’ emotion with little subtly? Sure, sign me up! I watch most of my movies while sweating away on a treadmill without sound anyway. I am not picky. At my women’s only gym, cooking shows and Hollywood romantic comedy share equal airtime on the television screens. Shows from both genre are frothy and forgettable. Do I pick up useful baking technique from watching Cupcake War? Do I learn how to host dinner party from the picture perfect set of Ina Garten’s East Hampton kitchen? Do I figure out how to lose a guy in 10 days? Or do I come to the conclusion that love can overcome amnesia? Oh and so the cynic prevails. There are exceptions, of course. Nancy Meyers’ Something’s Gotta Give is among one of them. Seriously, I can watch the courtship between Diane Keaton and Jack Nicholson over and over again. All the while, soaking in all the little details of the beautiful set (Hamptons! New York! Paris!) and cooking references. Everyone is entitled to some guilty pleasure, right? The phrase “use it or lose it” always rings a tone of desperation to me. It makes me feel panicky. Unfortunately, it is how I feel about my 8L of homemade rumtopf (read about its story previously). For a “dry” household, why did I feel the need to make such a ridiculous amount of fruit in rum? It all started with a very logical decision for risk management. Four smaller jars would surely give me a higher chance of success than one big jar, right? Lucky me, all four jars turned out to be awesomely delicious and I am stuck with the enviable problem of having too much rumtopf than I can realistically consume. I have no head for alcohol. Even a small serving of boozy tutti frutti would quickly get me smashed. Among the great list of ideas from Well Preserved, using the rumtopf to bake a cake caught my attention obviously. Fortunately, my appetite for cake and my ability to share cake fare much better than my drinking prowess. Besides, I was confident a drunken rum cake can make a serious dent in my rumtopf supply. I need to come up with a recipe. 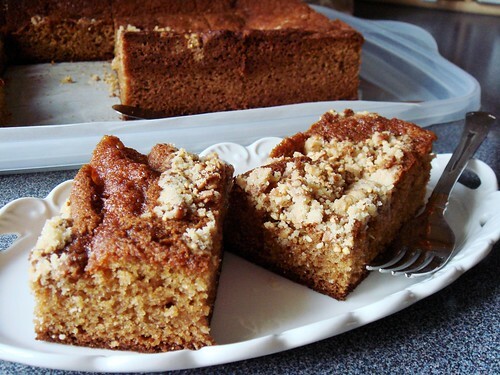 There is certainly no shortage of rum cake recipes but I have one specific requirement. 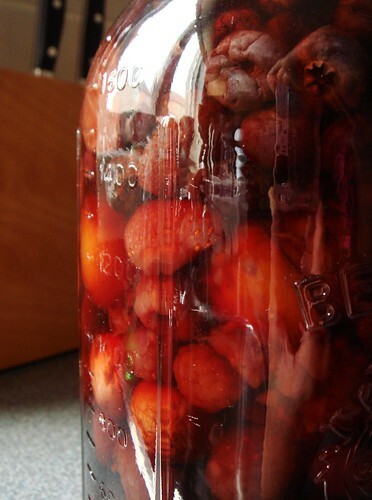 I want a recipe that can accommodate large amount of rum-soaked fruit pieces. Not only do the fruit add extra moisture to the cake, they are heavy too. I don’t normally post on Thursdays nor do I have much to say on Thursdays. This is the day my mind wanders to all the possibilities the weekend may bring. This is the day I fret about kitchen projects that I ought to wrap up. This is the day I frantically pack my bags if I am spending the weekend out of town. Which is all to say I don’t write on Thursdays. 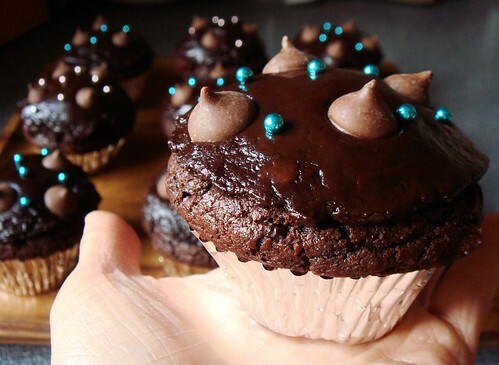 Today I’m making an exception because it’s National Chocolate Cupcake Day. Every day is a designated food holiday of some sort, 365 days a year. Why does chocolate cupcake inspire me to react? I blame it on insomnia. I would rather make something in the kitchen than tossing and turning in my bed. So today I celebrate. 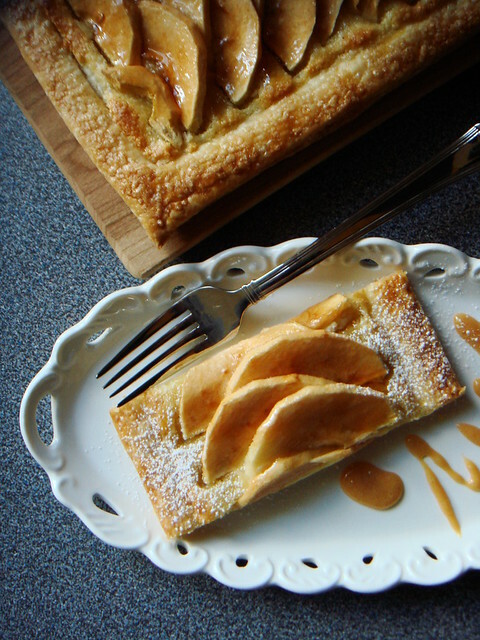 I celebrate with a recipe that I longed to make for months. 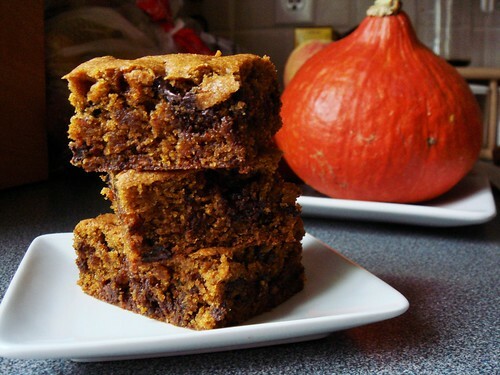 Baking with pumpkin should not be limited to sweet applications. I include pumpkin regularly on my dinner table in myriad forms. 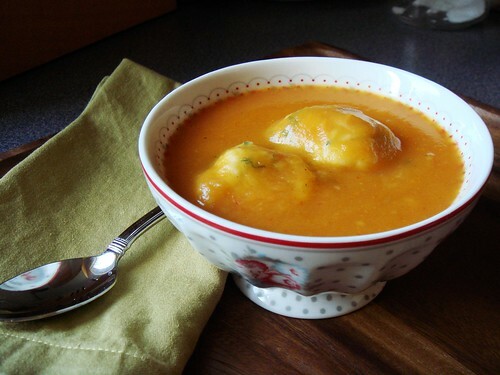 It can be a creamy soup, roasted in wedges with hints of caramel, or filled to the bream with bubbly cheese and bread. So why is it I automatically turn to molasses and cinnamon and cloves for help when I bake with pumpkin? Surely these two worlds can collide. 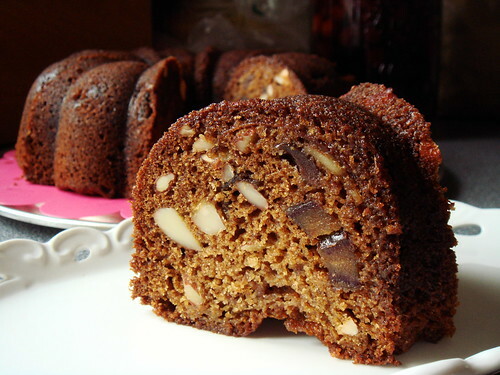 Pumpkin bread is a classic quick bread that I cannot get enough of. The same can also be said of cheese bread. Why not put them together? 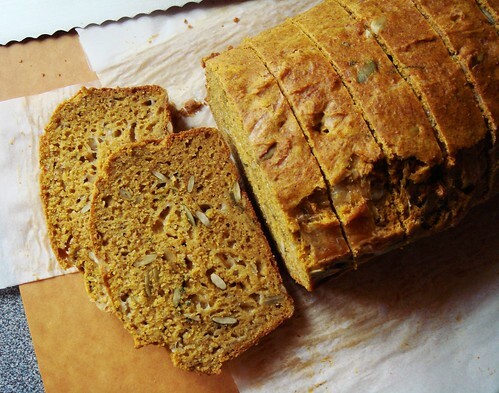 It makes perfect sense to bake a savoury loaf of pumpkin bread loaded with Swiss cheese and pumpkin seeds! 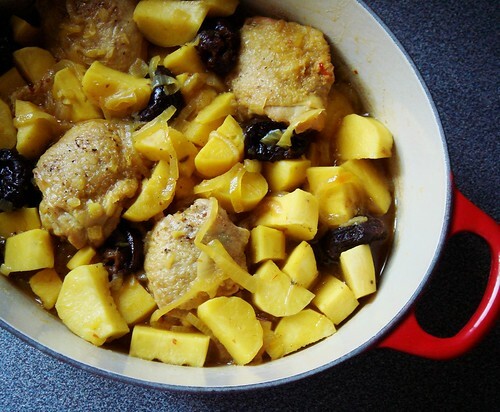 I further highlighted the harvest flavour with hints of fresh sage, nutmeg, dried mustard, and smoked paprika. A steaming hot bowl of breakfast porridge is hard to beat on cold mornings. Like it or not, the temperature is steadily dropping. I no longer just run out the door in a summer dress. I linger in my warm bed just a little longer every morning before reluctantly pulling on a cardigan. 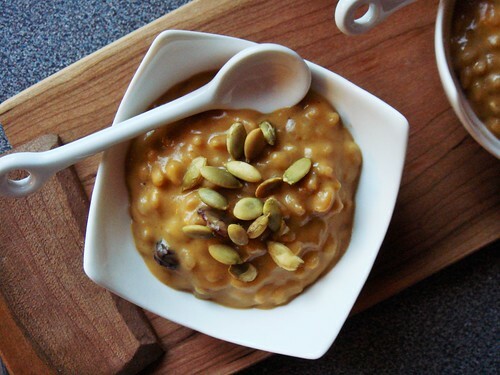 To most people, porridge is synonymous with oatmeal. Instant, minute, old-fashioned rolled, or steel cut, it’s still oats. What about other whole grains? Wheatberry, spelt, and farro make regular appearance on my dinner table. I love the chew of these large grains and the subtle nutty flavour is fantastic in salads. However, they all take a long time to cook so it never occurred to me to enjoy them for breakfast. That was until I learned the trick of overnight soaking. Soaking the uncooked grains in the fridge for a night softens them and significantly cut down cooking time. My enthusiasm for everything pumpkin has yet to wane even though Thanksgiving has come and gone. Last night I made a point to go to the grocery store to pick up a few extra cans of pumpkin puree because I have a good number of pumpkin recipes waiting in the docket. A few days ago, I read an article asking if pumpkin has jumped the shark. With the proliferation of seasonal sweets all featuring the gourd front and centre, how many of these actually tastes of pumpkin? Sometimes I wonder about the same thing too. Perhaps I’m simply drawn to the warm spices of cinnamon, cloves, ginger, and nutmeg. I am happy to report that the ridiculous amount of cakes and cookies all survived my flight from Toronto to Atlanta last weekend. My journey was much more eventful than I would like by first missing my early morning flight. I sat around the airport for hours waiting for my rescheduled flight on an empty stomach surrounded by all my baked goods at my fingertips. The cookies were at serious risk of being devoured before they even left Toronto! Luckily common sense prevailed with the help of toasted bagel and coffee. Every last piece made their way to Georgia in great shape. My shoulders had a good workout though with my unusually heavy but fragile luggage.